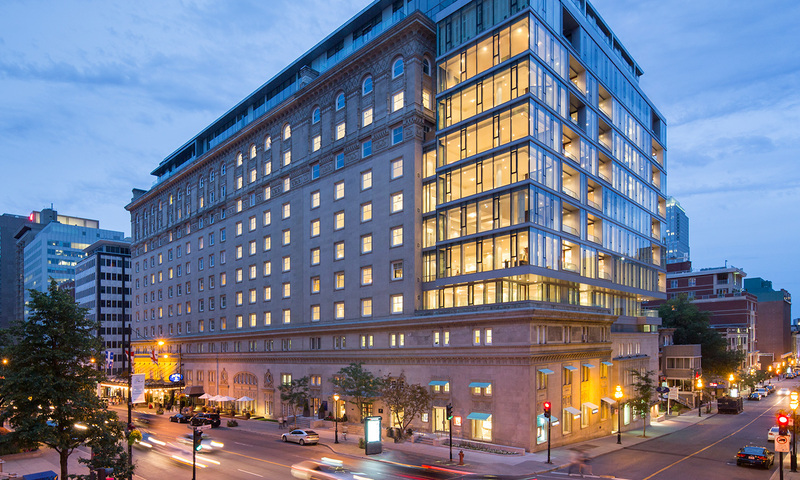 For the best in luxury accommodations in Montreal, Canada, the choice is The Ritz-Carlton Montreal. Built on 1912, this luxury hotel features 98 guest rooms and 31 suites. One of the suites is the largest found in Montreal. This prime, downtown property also features 45 private, luxury residences – Residences Ritz-Carlton, Montreal owners can enjoy a variety of five-star amenities including room service, a gourmet restaurant, private doorman, a swimming pool and patio located on the building’s rooftop, 24 hour concierge service, plus a new spa. Owners of a Residences Ritz-Carlton, Montreal property will have their own access by way of a private entrance on Sherbrooke Street. Located in the city’s Golden Square Mile, you are close to Montreal’s finest galleries and museums and high-end, luxury boutiques. Each unit features expansive living rooms and luxurious master suites offering incredible views of nearby Mount Royal and downtown Montreal, as it stretches southward toward the St. Lawrence River. The 45 units range in size from 1,250 square feet up to 8,600 square feet. 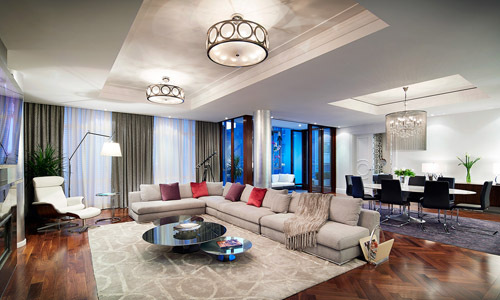 The Residences Ritz-Carlton, Montreal provides a VIP, residential experience that is unmatched in this city. What sets the The Residences Ritz-Carlton, Montreal apart is the VIP service that is available to its owners. We have included several personal stories that have become common and demonstrates what the essence of luxury service truly is. To provide a special moment that each resident owner receives during their arrival, the Director of Residences at the Ritz-Carlton, Montreal – Rucsandra Calin prepares a nice welcome package including a bottle of “Veuve Cliquot” Champagne and gifts from both Tiffany’s and Chanel Boutique. , all located next to the Residences, if they were willing to offer a special gift to her special residents. Lastly, the Ritz-Carlton hotel florist put together a special flower bouquet to each new resident owner. One owner was quoited, “you really made my day !” Another new owner was so excited, she stated “Wow, Oh my God, this is Christmas before Christmas! !” It’s these personal touches that really make a difference and sets the Residences Ritz-Carlton, Montreal apart. One newlywed couple was returning home from Bora Bora and received a wonderful welcome upon their return. Edith is the concierge and assistant manager and was able to get in contact with the bride’s mother in Italy, who suggested buying groceries for the traveling couple. Edith prepared special cold entrees and meal servings that could be reheated easily. Ii addition, delicious tasting desserts were prepared. The couple was so surprised and pleased, that the mother wrote a personal letter to Edith thanking her for the act of kindness. On Oct. 9th, 2013 the Ritz Carlton Montreal hotel was hosting the annual “night of hundred dinners” from the Montreal Jewish community. To be part of this dinner event, each participant had to donate a $1,000 contribution to one of Montreal’s various causes and organizations such as kindergartens, foundations, hospitals, etc. The theme for last year’s event was “Cotton Club” from the 1930’s, based on the famous Jazz club in New York City. Rucsandra Calin was asked to assist and wanted to make this event special and as authentic as she could. After researching, she discovered the original Cotton Club menu, the musical program that was performed and an original poster. Calin hired a live jazz band for the evening to play song titles from the popular Cotton Club movie. Dinner guests were welcomed by the doorman, concierge and porter upon their arrival. The hotel’s staff dressed in the Ritz-Carlton uniforms from the 1930’s. This wonderful evening of entertainment and fine dining was a huge success. $45,000 of donations were raised during the event and everyone had an incredible night of fun. It really was a “night to remember” and made possible by the dedicated staff of The Residences at the Ritz Carlton, Montreal. During the holiday season last year, Dr. S who is a resident owner at the Residences at the Ritz-Carlton, Montreal wanted to surprise his family for their annual Christmas dinner in the hotel’s luxurious Blue Room. With 11 grandchildren and 4 children visiting and celebrating Christmas, Dr S wanted Santa Claus to make a special visit. Alain the hotel’s concierge, wanted to see the grandfather get his wish and offered to play Santa Claus as he has done for many years in different occasions. Alain customized the experience by writing and sending a letter on official North Pole paper to notify the guests of Santa’s planned visit. He also created eleven “Official Santa’s Certificate of good behavior” made out to the doctor’s grandchildren. Alain as Santa Claus was a huge hit and arrived with a large bag of gifts fort the family. It was another moment of superb customer service and going the extra mile by the Ritz-Carlton Residences concierge team. Please contact The Life of Luxury to book your travel reservation at Residences Ritz-Carlton, Montreal for a true VIP experience. Return here often to read about other luxury travel packages and industry news by following this luxury blog.